This chapter examines the plausibility of establishing a normative stance on immigration using cosmopolitan theories based on the notion of original common ownership of the earth. First, the Kantian cosmopolitan stance and the (qualified) right to mobility from which this idea is deduced are examined. Then, the common ownership of the earth theory recently proposed by Risse is examined. Though limited in its scope, Kant’s theory allows current legal understandings of immigration to be broadened, both in regards to refugees and certain economic immigrants. For its part, Risse’s theory proves unsuitable for addressing current migratory pressure. Lastly, a more extensive understanding of the right to immigrate is argued for based on a conception of common humanity articulated as an equal opportunity principle. 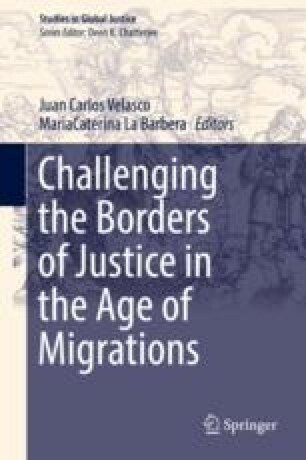 This work has been realized within the framework of the project Fondecyt (1160982) and Derechos humanos y justicia global en el contexto de las migraciones internacionales [Human rights and global justice in the context of international migrations] (FFI2013-42521-P). Blake, Michael, Risse, Mathias. 2006. Is there a human right to free movement? KSG Working Paper No. RWP06-012, https://doi.org/10.2139/ssrn.902383.